Is the NFC West that bad? In his writeup, he cited the poor state of the NFC West since realignment – a paltry 42% winning percentage, the worst in football. I wondered if this was significantly worse than average, or if it was just random chance. I looked at Bill Simmons’s data and compared it to the same time period for the MLB, which has its own problems with divisional alignment and the wildcard. My hypothesis was that the MLB divisions would be as bad or worse than the NFL due to strong divisions like the AL East and poor divisions like the AL Central. I found that the NFL had more variation. Since 2002 the AFC South, with powerhouse Indianapolis and strong Tennessee teams, has performed 1 standard deviation above average. 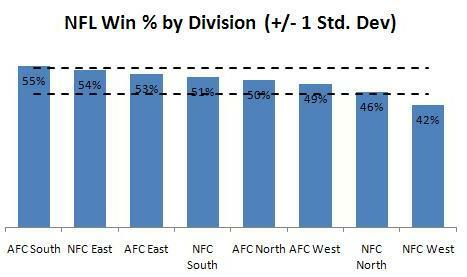 The terrible NFC West is almost 2 standard deviations away from the average. Indeed, the NFC West is that bad. 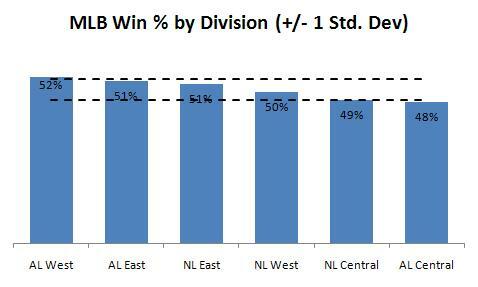 Since 2002 the MLB has had much less variation. Every division is within a standard deviation from the mean. Surprising to me, the AL West has the best performance, with the AL East not far behind. The AL Central is indeed the worst, but not significantly so. So, should the leagues change the playoff format to prevent weak divisions from sending unworthy representatives to the playoffs? For the MLB, the answer appears to be no. No division has shown significant performance variation. While the Rangers, among others, have advocated shifting divisions (possibly driven by their relatively strong competition), the case is weak. The NFL, on the other hand, does have a significantly under-performing division. A team with a losing record emerging from the NFC West to reach the playoffs could be the spark the owners need to make a move. And with an expired collective bargaining agreement, this off-season would be the time for divisional realignment.